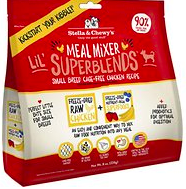 At first glance, you might think that Stella and Chewy might be the owners and proprietors of this specific type of dog food. If so, your thinking would be incorrect. Let’s take a closer look at this company to see how it originated from one small idea. The Founder and President of this company is Marie Moody, a pet owner herself who started her business with no intention of growing it into a lucrative business. So why, then? Well, when Marie was living in Los Angeles, she decided to adopt a dog named Chewy who had some serious health issues. Her veterinarian suggested that you put her rescue dog on a specific diet of raw meat and vegetables. Marie made this diet of raw meat and vegetables from her own kitchen, and fed this to Chewy. Within a relatively short time, Chewy’s health continued to improve and Marie then had a thought that would change her life forever. 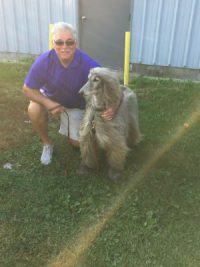 She came to the conclusion that there had to be other pet owners who were facing the same circumstances and decided to produce raw pet food recipes that were free from processing and grain-free ingredients. Chewy and her other dog, Stella, became her ‘testers’ and Marie quickly realized the benefits of this type of diet. A decade later, Stella & Chewy’s frozen and freeze-dried raw, natural dog and cat food is available in more than 3,000 retail stores nationwide. Quite a jump from one kitchen in a small apartment! 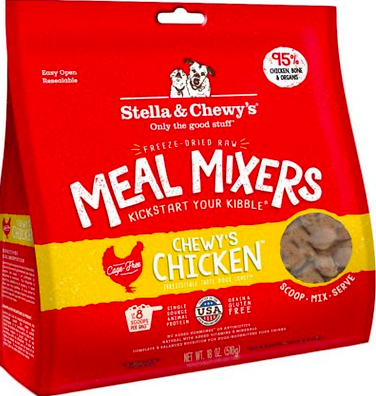 What Is Stella and Chewy’s Dog Food? The Stella and Chewy dog food product is manufactured with the belief that dogs will benefit from a diet of raw ingredients. The company is firm on their beliefs that processed pet food, with added preservatives, artificial coloring and other unwanted ingredients will not provide a nutritional diet. 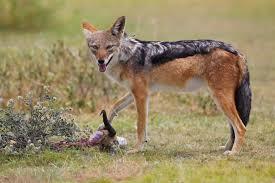 Dogs are indeed carnivores, and a meal that closely resembles what nature has to offer, provides your pet with a better source of nutrition. This is the company’s belief. Stella & Chewy’s are dedicated to only using the finest ingredients in the process of their recipes. These ingredients are received from farmers and ranchers that the company has great trust in. Simply put, when you think of Stella and Chewy’s Dog Food, the word ‘raw’ should quickly come to mind. The company’s philosophy is based on this concept. Furthermore, they believe a raw diet combined with all-natural ingredients will provide your pet with a healthy and balanced overall diet. Quick and easy way to feed your four-legged companion. No thawing or freezing necessary. Simply open and serve and provide your dog with a balanced, natural diet. Flavors include Beef, Chicken, Lamb, Duck-Duck Goose, Turkey, Red Meat, Surf N Turf, Venison, Rabbit, Chicken & Salmon Perfectly Puppy and Beef & Salmon Perfectly Puppy. Use this nutrition packed product to boost your pet’s health by adding a scoop to each meal. Contains a complete nutritional package to your pet as well as added probiotics to ensure healthy digestion. 100% certified organic fruits and vegetables with quality, wholesome meat will get your dog running to the dinner bowl. Flavors include Chicken, Beef, Turkey, Salmon & Cod, Lamb, and Duck-Duck Goose . For obvious reasons, the Stella & Chewy raw recipes can not be shipped but you will be able to find these products at your favorite pet store. For your convenience, I have listed these products below with some pertinent information of each. 2.) Frozen Raw Dinner Morsels – Looking for a faster alternative to the thawing process? These morsels can be thawed quickly and prepared for your pet’s meal in a very short time. Same quality ingredients as the patties. What Are The Benefits Of The Stella & Chewy Products? To answer this question, you must consider the philosophy behind this company. As mentioned earlier, the company firmly believes that our pets should share the same advantages of raw food as their ancestors did years ago. 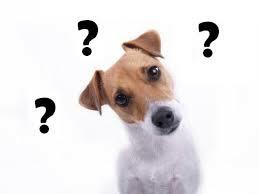 Natural, without the influence of unwanted chemicals that are often used in the processing of pet foods made today. I hope this review has helped you in making a wise decision in providing your pet with a diet that is healthy and nutritious. Without hesitation, the Stella & Chewy brand is one that I would highly recommend. The fact that the recipes are produced with quality, natural and organic ingredients has become quite popular with dog owners everywhere. For those looking for a quality pet food, the Stella & Chewy brand won’t disappoint. 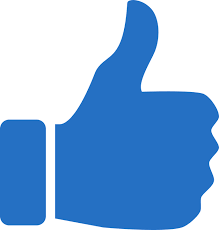 For me, this product gets a definite, ‘thumbs up.’ Thanks for stopping by and please leave a comment below and let me know what you think of this particular brand.